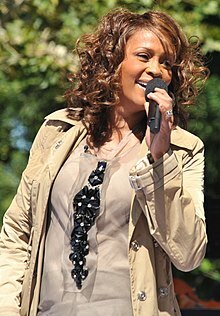 Whitney Elizabeth Houston, ameriška pevka R&B, soul in pop glasbe; igralka in filmska producentka, * 9. avgust 1963, Newark, New Jersey, † 11. februar 2012, Beverly Hills, ZDA. ↑ "Whitney Houston biography". whitneyhouston.com. August 19, 2009. Pridobljeno dne November 22, 2010. ↑ Dobuzinskis, Alex (September 15, 2009). "Whitney Houston, as of 2009, said she was "drug-free"". Reuters. Pridobljeno dne January 13, 2010. ↑ "Whitney Houston Biography". whitneyhouston.com. Pridobljeno dne January 12, 2010. Čas zadnje spremembe strani: 17:56, 19. februar 2016.